CONTINENTAL CONGRESS. Book. Extracts from the Votes and proceedings of the American Continental Congress, held at Philadelphia on the 5th of September 1774 Containing the Bill of rights, a List of grievances, Occasional resolves, the Association, an Address to the People of Great-Britain, a Memorial to the Inhabitants of the British American Colonies, and an Address to the Inhabitants of the Province of Quebec. New-London: Timothy Green, 1774. Quarto, 16 pp. Sewn as issued. Edges chipped with small loss at corners of first leaves (not affecting text). 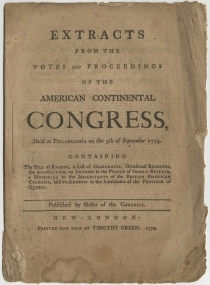 The First Continental Congress met in September 1774 as Americans united in their desire to maintain their English rights but unwilling to accept the decades of coercive Parliamentary actions intended to reestablish dominion over the recalcitrant colonies. Laying a foundation for American independence, it passed a Declaration of Rights on Oct. 14, in which the colonists protest violation of their rights as Englishmen by the Stamp Act, the Townsend duties, the Coercive Acts, and the Quebec Act. It asserts the colonists’ rights to peaceably assemble and maintain their own legislatures. It also records the formation of the Continental Association, where the colonies (but for Georgia) agreed to mutual non-importation, non-exportation, and non-consumption of British goods. They further resolved to gather the following May if there had been no redress, and included two addresses, one directly to the people of Great Britain and another to the inhabitants of the colonies that justified their actions. Moving at the speed of government, justices Law and Mumford ordered the bill paid in September 1775 and forwarded it to treasurer John Lawrence in Hartford, who then paid Green’s representative Caleb Knight on November 14 1775, and then audited the following May. Richard Law (1733-1806) was an American lawyer, jurist and statesman from New London, Connecticut. He graduated from Yale in 1751, passed the bar in 1755, and practiced privately until he became a justice of the peace in New London, 1765 to 1775. Law had a lengthy career serving in the Connecticut General Assembly, as that state’s delegate to the Continental Congress, and as chief judge in New London County. In 1789, President George Washington nominated Law to sit on the newly established U.S. District Court for the District of Connecticut. Thomas Mumford (1728-1799) was a wealthy merchant and ship-owner who served as Groton’s representative in the Connecticut General Assembly. Mumford was instrumental in financing the expedition against Ticonderoga, and later played a major part in New London’s privateering business outfitting this informal Revolutionary War Navy. When the British burned New London and took the fort in Groton during the battle of Groton Heights his house was destroyed. James G. Mumford, Mumford Memoirs. . . (Boston, 1900), pp. 192–5. 1775 Jan. 10th/ Richard Law, and Thomas Mumford, Esqrs, Drs.